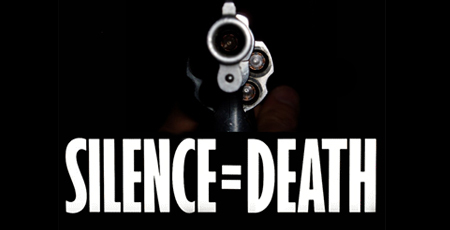 Silence = Death was the message created by a group of gay activists in 1987 to make the point that AIDS had to be fought, first, with noise. Posters with this message were pasted on walls around New York City; the posters had an entreaty to "Turn anger, fear, grief into action." Act Up was formed shortly thereafter to make noise and take action and it got results. We must do no less now. After the Newtown massacre, Mayor Bloomberg issued a statement in response to President Obama's pledge to take meaningful action in the wake of the tragedy. The Mayor said, "Calling for 'meaningful action' is not enough. We need immediate action. We have heard all the rhetoric before. What we have not seen is leadership – not from the White House and not from Congress. That must end today. This is a national tragedy and it demands a national response." On issues of gun safety, we need to make noise. We need to make sensible reforms, reforms that won't prevent every massacre or every murder but will reduce the amount of gun violence in this country. What those sensible reforms are is not a mystery nor are the obstacles, by which we mean the NRA, insuperable. Lawmakers know what to do. They will only act, though, if they are forced to do so. By us. Silence is no longer an option. • Destigmatize mental health issues through public education and raise awareness of treatments. • Create a universal background check, with no gun show loophole. Here are a few ways to make noise. ‣ Demand a Plan from President Obama. ‣ Tell your Senators and Representatives what you think. ‣ Andrew Cuomo: you want to run for President in 2016? Don't just raise lower the state flags to half-staff. Show some political courage… Tell the Governor @NYGovCuomo to lead on this issue. And hold him to his promise on microstamping. ‣ Tell Congresswoman Carolyn McCarthy that you support her work on this issue.